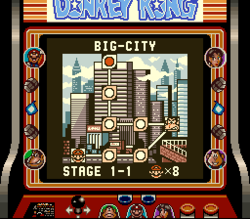 Big-City is the first world of Donkey Kong for the Game Boy. After Donkey Kong is defeated in the prologue, he gets up and takes Mario's lady friend Pauline, escaping with her to this city. The city introduces most of the new gameplay elements of the Game Boy game, such as Keys that need to be taken to doors to proceed in the levels, as well as Roads and Ladders that can be placed in specific slots and extended from there. 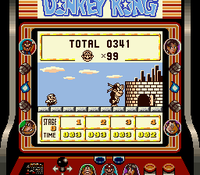 Big-City features eight stages, two of which are boss fights with Donkey Kong. The levels of Big-City show a common metropolitan landscape with skyscrapers and office buildings. In the foreground, Mario encounters conveyor belts, girders, trash cans, and power lines that he can use to flip and jump off of. Among the variety of enemies introduced in the Big-City, Bowbows and Rappies have basic behaviors that are also seen in enemies that reside in later worlds. On the other hand, Faiachū, Wire Traps, Oils, and Trash Cans stand as unique obstacles encountered by Mario. After the first encounter with Donkey Kong in Stage 1-4, Road Blocks and Ladder Blocks show up and allow Mario to create temporary platforms and ladders respectively. As with all stages in the game, three of Pauline's material possessions are scattered across each stage of Big-City, and Mario can collect them to play a bonus game once he completes a stage and his score finishes tallying. The instruction booklet of Donkey Kong Land states that Big Ape City is Donkey Kong's "favorite stomping ground" and also calls it "Big City" in its description, implying the locations are the same. This page was last edited on April 13, 2019, at 10:19.